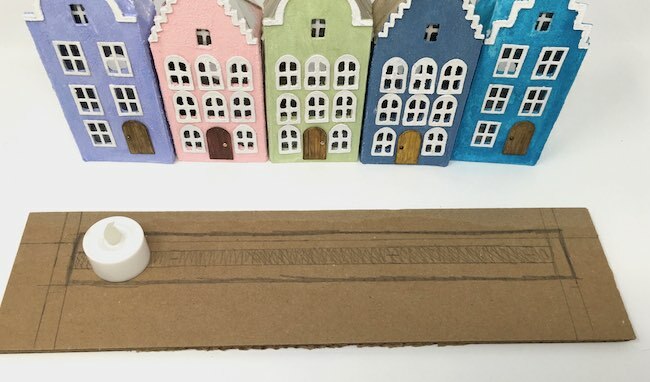 When you make a row of little cardboard houses you need a unique cardboard base that accentuates them. 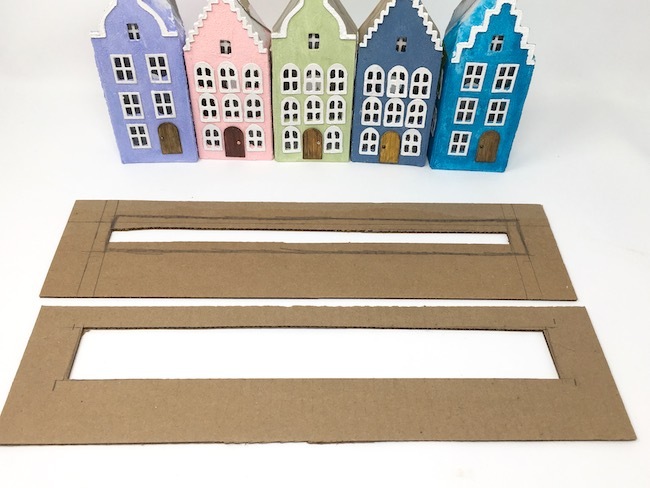 Because the post on making the Dutch Canal Putz houses is long, I decided to write a separate post on how to make this cardboard base. 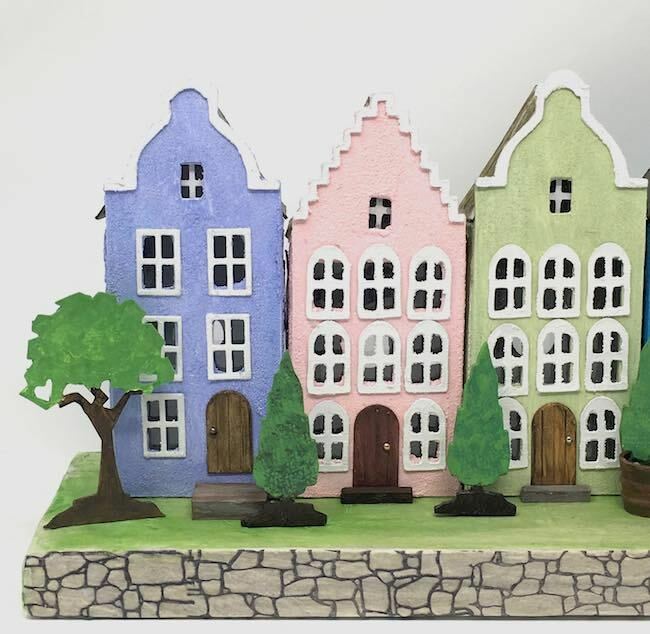 I struggled for awhile to figure out how to arrange and decorate these little Amsterdam Canal houses. 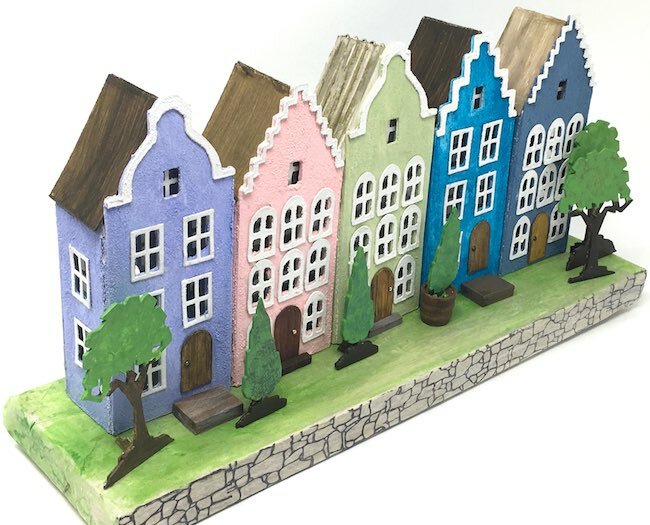 Finally I saw some drawings on Pinterest that helped me decide to make a Rainbow Row of houses rather than separate them on individual cardboard bases. 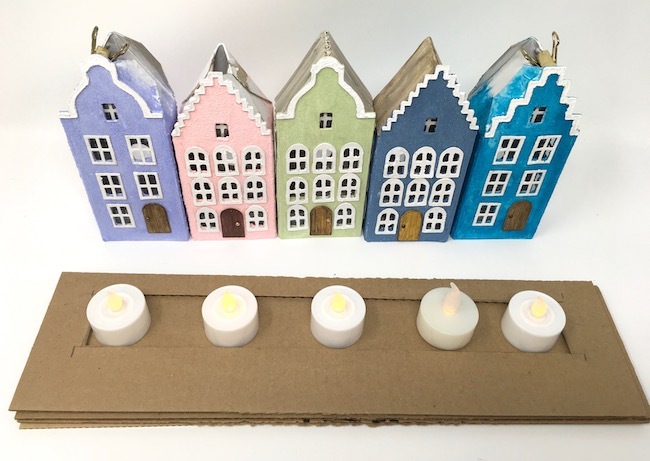 Also to light the little houses I needed a cardboard base with slots for LED lights. 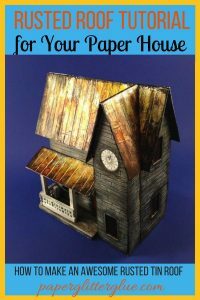 Cut cardboard large enough for the houses with 1 extra inch on each side of the little houses. Set the houses where you want them to go. I like to have some extra space in the front for landscaping. The LED tea lights are 1.5 inches in diameter. 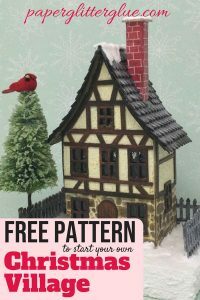 And these houses are also 1.5 inches wide. So I cut enough layers of corrugated cardboard to cover up the body of the LED light and make a smaller slot so the light bulb shows through. The piece of cardboard in the front shows the colored in section to cut out the slot for the LED light bulbs to show through. Cut several layers for the body of the LED lights – usually it takes about 6 layers of cardboard for that. 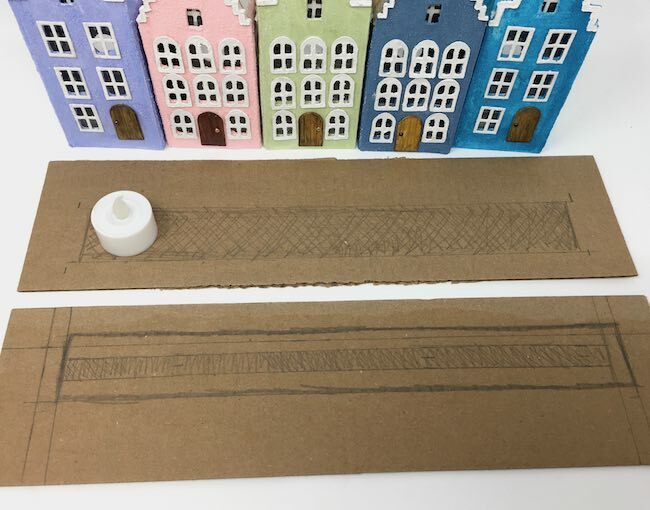 Use a hot glue gun to glue the layers of cardboard together. This is the fastest method. In the past I used regular glue, but it took so long to dry that the layers would pop apart. Hot glue is the way to go. The final layer should be the narrowest slot for the bulbs to show through. 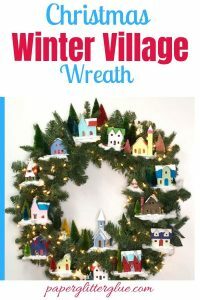 Now cover the 6-7 layers of cardboard with brown paper using Mod Podge. Try to fold the corners neatly. That’s not what I usually do because I kind of like messy corners on Halloween houses, but for Rainbow Row the corners need to be neat. Next paint the covered cardboard base with gesso primer. Then paint with a color matching the stone. Because the Dutch canal houses are on a stone-lined canal, I stamped collage paper with a stone stamp. 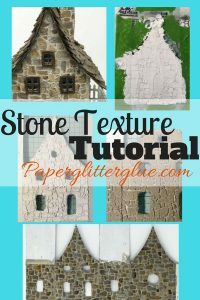 Apply the paper to the edge with Mod Podge. Since the Amsterdam canal houses are colorful, I chose a muted green for the base. Now add the landscaping to the cardboard base after the little houses are in place. 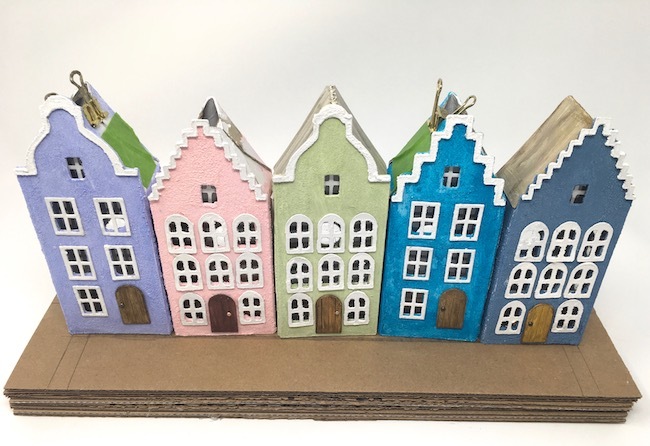 The next post will go over how to make all the Amsterdam Canal Putz Houses on Rainbow Row. Another great instruction sheet. Thank you!